SANTA FE, NM – Thousands of seedlings are still available for purchase through the New Mexico State Forestry (NMSF) Conservation Seedling Program. Species include Ponderosa pine, Douglas-fir, bur oak, prairie sky poplar, chokecherry, desert mountain mahogany, woods rose and many more! The deadline to order online is April 12, 2019. Albuquerque, NM, June 19, 2018 – While some portions of Cibola National Forest and National Grasslands received up to two inches of rain last weekend, it was not enough to lower the fire danger significantly. Forest fuels are quickly drying out again and the extended weather forecast calls for continued very hot and dry conditions. A substantial amount of precipitation will be needed before the current fire restrictions can be lifted. To reduce the risk of human caused fires and to ensure the safety of fire fighters, the public, and our precious natural resources, please observe the following restrictions: •	The Mountainair Ranger District will remain in full closure, including all Forest Service roads, trails, and picnic areas. •	The Sandia Ranger District remains closed, including all Forest Service roads, trails, and picnic areas except for Foothills Trail #365, the Sandia Peak Tram, and the Sandia Ranger District Administrative site which includes the Tijeras Pueblo, trail, and programs. •	Stage II fire restrictions remain in place on the Mount Taylor and Magdalena Ranger Districts and the Kiowa-Rita Blanca National Grasslands. To learn more about New Mexico fire restrictions, visit https://firerestrictions.us/nm/ . 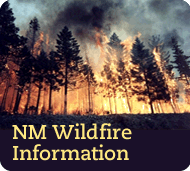 Fire updates are also posted on the New Mexico Fire Information website at www.nmfireinfo.com. One conference in three locations. The conference theme is "Fuels of Today – Fire Behavior of Tomorrow" Understanding Fire Behavior and Fuels for Sound Decision Making and Effective Management. News Update about the released the final Restoration Plan and Environmental Assessment (“final RP/EA”) for the Chevron Mining Inc. Questa Mine (“Site”). Please join us for an informational webinar to learn more about the recently released announcement of available funding through the Bureau of Indian Affairs' Tribal Resilience Program. During this webinar, BIA will discuss the current Request for Proposals - Tribal Resilience and Ocean and Coastal Management and Planning. After the presentation, there will be a question and answer session. Join us for the third seminar in the Spring Seminar Series for Fireshed Awareness Season. Royce Fontenot, a Senior Service Hydrologist for NOAA/National Weather Service (NWS) will present on post-wildfire flooding, debris flow and flash flooding, and how to get the NWS warnings. Mannie Lopez with the U.S Geological Survey will present on post-fire flooding in Santa Fe Municipal watershed. FOREST BOUND is a FREE native plant ecology training program for high school age youth, utilizing the Native Plant Curriculum, From Ponderosa to Prickly Pear, developed by the Institute for Applied Ecology. You are Invited to Participate with students and other citizens, agencies (Forest Service, Game and Fish, State Engineer) and non-governmental organizations (Rio Grande Water Fund, NM Association of Conservation Districts, Chama Peak Land Alliance, Rio Grande Restoration, others) and help to decide how to best address our water and land management challenges in the Chama Basin. Questions? Contact Steve Harris at home/office: 575-751-1269; 575-770-2502 cell or: steve.harris39@gmail.com. From 02/09/18 New Mexico In Focus broadcast: This month on “Our Land: New Mexico’s Environmental Past, Present and Future,” we head to Sandia Peak—and learn what’s missing up there right now. With Kerry Jones, a warning coordination meteorologist with the National Weather Service, we learn why this year’s record-low snowpack has such big implications for New Mexicans across the state. A “water year” runs from October 1 through the end of September, and New Mexicans right now are standing at the driest start to any water year on record—that is, all the way back to the 1890s. Lecture by Katie Zemlick, Civil Engineering, UNM. Part of Fall 2017 series "Water and Energy in NM: Conversations on our Common Future." The International Association of Fire Chiefs , National Association of State Foresters, National Fire Protection Association and USDA Forest Service are now accepting nominations for the 2018 Wildfire Mitigation Awards. Nominations are due November 10, 2017. Training opportunity THIS SATURDAY, June 10th!! Home hazard assessment training and woodland restoration workshop! Join Krys Nystrom of the Wildfire Network, Jan-Willem Jansens of Ecotone Landscape Planning, and Zander Evans of the Forest Stewards Guild for a wildfire home hazard risk assessment training and tour of a woodland restoration project in the Wildland Urban Interface. The training will take place at a private residence and to limit parking issues we will be meeting at 9:45 am the Atalaya Lower Trailhead parking lot off of Camino de Cruz Blanca in the St. John's College parking lot. To find out more about the event please call Zander Evans at 505-603-2550 or zander@forestguild.org. NM Prescribed Fire Council announces its Rx Fire Trailer! The NM Rx Fire Council has put together a trailer with all the equipment required to conduct a prescribed burn. Contact the Council if you would like to rent the trailer for your next burn project. Webinar presented by Jeremy Weiss, Climate and Geospatial Extension Scientist at the University of Arizona, and hosted by the Desert Landscape Conservation Cooperative. The 2017 Spirit of Bipartisanship Award honors lawmakers or community leaders who put good policy above partisan politics! Nominate a leader you think is a role model for cross-party collaboration in areas such as health, education, economy or environment. Your nominee can work at state, local or federal levels. You can recommend an individual or a bipartisan duo! Nomination deadline: March 31, 2017. The Surface Water Quality Bureau (SWQB) is seeking public input on two upcoming surface water quality studies; one in the San Juan River watershed and one in the Upper Rio Grande watershed. The results of the surveys will be used to determine water quality status, track water quality improvements, and identify impaired waterbodies. Meg White of The Nature Conservanciy will present on "Vegetative and Geomorphic Complexity at Tributary Junctions on the Colorado and Dolores Rivers: A Blueprint for Riparian Restoration"
The USDA Office of Sustainability and Climate Change posted a 2-hour introduction to upcoming opportunities related to drought and water challenges. The aim is to engage Forest Service employees and partners in planning for and adapting to the impacts of drought and other water challenges in the face of a changing climate. The Sandia Ranger District will host a Bio Blitz on May 14, 2016, from 8:00 AM until 12:00 PM, at the Cienega Picnic Grounds. The public is invited to attend. Participants must register at the event, but there is no charge to participate in the Bio Blitz. Community tree inventorying can be valuable at any scale, from park or neighborhood counts with volunteers to canopy assessments using advanced aerial technology. Join us for a workshop where we'll share efforts happening in New Mexico now, fresh technologies and ideas, and a discussion on inventory needs in New Mexico. Join us in person or via webinar. The Sandia Park Scenic Byway Firewise Community is hosting a Fire Fair to help residents prepare for fire season. Since its inception in 1999, the Forest Stewards Guild youth conservation corps (YCC) program in New Mexico has employed over 500 youth and achieved more than 200,000 hours of conservation service and education benefiting public lands. EPA is making the link between water quality and quantity and how hydrologic alteration (dams, diversions, interbasin transfers, stormwater, etc) may impair designated/existing Aquatic Life Uses, ways to monitor for it, and ways to implement in State's Water Quality Standards, TMDLs, and NPDES and 404/401 permitting. Thursday, June 2nd is the established date for the workshop/training in Albuquerque! The event will be hosted by the UNM Utton Transboundary Center in the Rotunda on UNM's South Campus, and will be all day - 8:30-4:30 (agenda to follow). Albuquerque, New Mexico, April 13, 2016 - The Environmental Assessment (EA) for the Cedro Landscape Restoration project has been published and is ready for public review. The project area is located on Cibola National Forest and National Grasslands’ Sandia Ranger District. It is designed to restore the ecosystem to desired conditions. High tree density and severe competition have created conditions that compromise forest health, wildlife habitat, and scenic quality; these conditions also increase the likelihood of high-intensity wildfires. The 2016 Wildland Urban Interface (WUI) Summit will be held March 31st through April 2nd in Silver City, New Mexico at the Besse-Forward Global Resource Center on the Western New Mexico University Campus. New Mexico In Depth - January 5, 2016 - Is the Rio Grande headed for "Permanent Drought"? In New Mexico, water rights are mind-bogglingly complicated. But the simplified version goes something like this: Water in streams and rivers belongs to the public and it’s held in trust by the state. Are You Ready for Love Your River Day? We Are! I know it's hard to believe, but February is right around the corner! It's time to mark your calendars for Love Your River Day on Saturday, February 13th at Frenchy's Park in Santa Fe. The fast-growing field of “citizen science” is a proven way for local residents—young and old—to build direct connections to their environment and help professional scientists conduct essential research. New Mexico Forest Industry Association is proposing to hold a Forest Worker Safety Certification class in Silver City on February 24-26, 2016. All ecosystems are dynamic, changing due to growth, succession and disturbances. Modeling large landscapes in the United States requires the collective knowledge of experienced and knowledgeable vegetation and fire experts. In collaboration with hundreds of colleagues, LANDFIRE produced more than 1,000 state-and-transitions models and descriptions — one for every ecosystem (called Biophysical Settings or BpS) mapped by the Program. The result is a major contribution to basic and applied vegetation ecology across the country. Returning Heroes representatives will be recruiting at two career fairs this week! WASHINGTON — The risk of severe wildfires in the West also threatens the region’s increasingly scarce water supply, a new study finds. The New Mexico State Forestry Division has achieved accelerated progress in Governor Susana Martinez’s Watershed Restoration Initiative. The $6.2 million appropriation was signed into law in 2014, issuing severance tax dollars to treat priority watersheds on public land. By the end of this year, nearly half of the targeted 7,700 acres will have been completed and seven (7) of the projects will be finished. REGISTRATION OPEN: 2015 SAF Convention Recreating Forestry: The Confluence of Science, Society and Technology - Join us in Baton Rouge, Louisiana, November 3-7, where forestry and natural resources professionals from across the country will discuss contemporary forest resource management issues and examine the trends and technologies shaping the profession. Washington – In an historic step for the protection of clean water, the U.S. Environmental Protection Agency and the U.S. Army finalized the Clean Water Rule today to clearly protect from pollution and degredation the streams and wetlands that form the foundation of the nation’s water resources. The Flagstaff Watershed Protection Project won the People's Choice award in a national Solution Search competition hosted by the nonprofit Rare. Flagstaff Watershed Protection Project Operations Specialist Mark Brehl accepted the award in Washington D.C. on Monday. Plants have been hailed as possible saviors of the planet as it continues to warm up, especially considering that they can absorb more harmful carbon dioxide than previously thought. However, now new research says soil nutrients may hinder this plan, keeping plants from slowing down climate change. Tamarisk invasion & fire webinar recording now AVAILABLE! For those of you who missed the webinar on April 2nd "Tamarisk invasion and fire in Southwestern desert ecosystems," a recording is now available via the FRAMES website. High Rolls, NM – Work has begun on the 1344-acre Two Goats Watershed Restoration Project south of the community of High Rolls in the Sacramento Mountains. Celebrate Arbor Month, New Mexico! It’s not just one day, we get an entire month to celebrate trees and the importance they have to all New Mexicans. The State Forestry Division wants everyone to celebrate Arbor Month by planting or caring for trees and taking part in community activities. Southwest Fire Science Consortium webinar, Jan. 2015. available at https://www.frames.gov/rcs/18000/18920.html. The New Mexico Environment Department (NMED) Surface Water Quality Bureau (SWQB) is seeking public input on planning for a surface water quality study of the Canadian and Dry Cimarron watersheds. First in the Green Infrastructure miniseries of "Nature's Returns: Investing in Ecosystem Services" webinar series. Sponsored by the Yale Center for Business and the Environment. Special presentation by Tamarisk Coalition on tamarisk leaf beetles in the Colorado River system. San Juan College, October 7, 2010. Service Project will improve wetlands in Cebolla Canyon south of Grants, NM. Wednesday, February 6, 2013 - This week the U.S. Forest Service released the Effects of Climatic Variability and Change on Forest Ecosystems report. The report warns that big changes are in store for the nation’s forests as global warming increases wildfires and insect infestations, and generates more frequent floods and droughts. The compilation of more than 1,000 scientific studies is part of the National Climate Assessment and will serve as a roadmap for managing national forests across the country in coming years. Along with more fires and insect infestations, forests will see more flooding, erosion and sediment going into streams, where it chokes fish habitat. More droughts will make wildfires, insect infestations, and the spread of invasive species even worse. The NFPA has a new website for home/landowners for their Fire Adapted Communities program. The San Juan Watershed Group has released it's January 2013 newsletter. The Divining Rod newsletter is provided by the NM Water Resources Research Institute). The Environment Department requests public comment on a report supporting water quality standards changes to Smelter Tailings Soils Investigation Unit Drainages within the Chino Mine Investigation Area, Grant County, New Mexico.